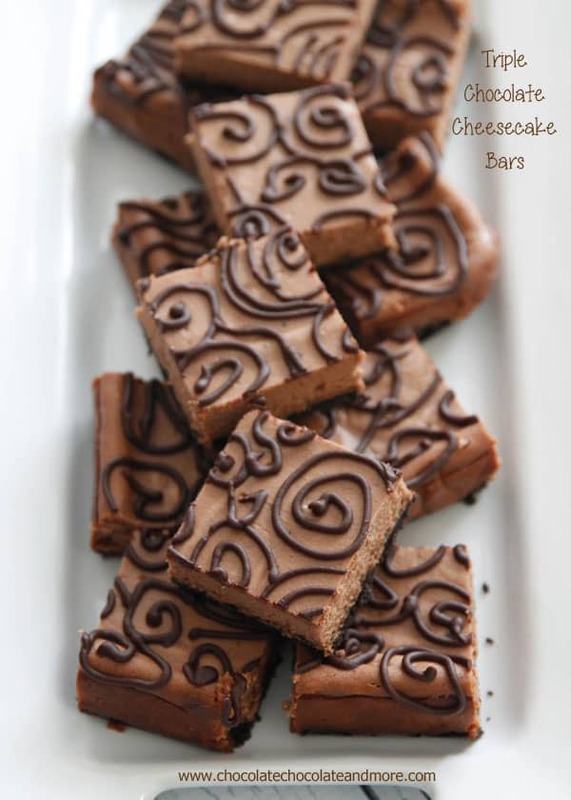 Triple Chocolate Cheesecake Bars - Chocolate Chocolate and More! I adore cheesecake. I can eat it any time, any place. People seem to think making cheesecake is hard and they avoid it. Or they have one bad experience and give up. We’ve all had that horrible giant crack right in the center of our cheesecake at one time or another. When that happens, just cover it with a topping. I’m sure that’s how cherry cheesecake was originally invented. I always have more success when I make bars. I’m not sure why. I do know when I make bars, they get eaten faster. 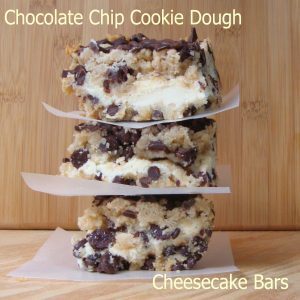 Just because you choose to make bars instead of a traditional round cheesecake doesn’t mean it can’t be pretty. 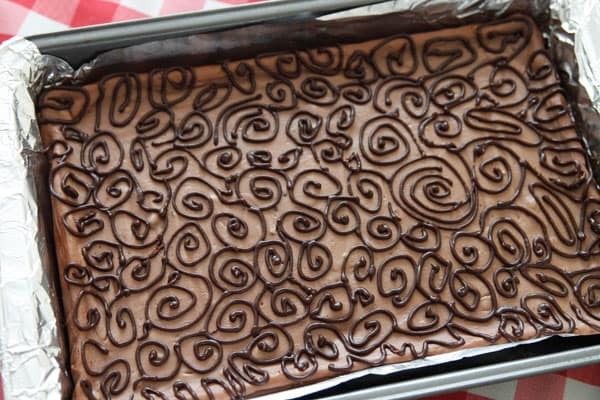 Let your inner 4th grader out and have some fun doodling with chocolate ganache. It may look like scribbles. It may look like your child did it. But when you slice these bars up and put them on a serving plate all you’ll see is elegance. And then you’ll see them disappear. Line a 9 x 13 baking pan with foil, lightly spray with non-stick cooking spray. Combine crushed Oreo cookies with melted butter until all crumbs are moistened. Press crumb mixture into bottom f prepared pan. Set aside. Cream cream cheese until smooth. Add in sugar and vanilla, beat well. Add cooled chocolate and beat again until combined. Add in eggs, one at a time, beating just until combined. Make sure to scrap down sides of bowl. 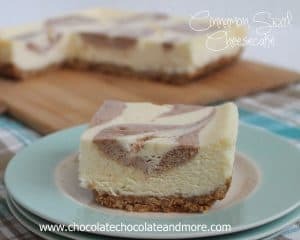 Spoon cheesecake mixture over prepared crust and smooth to edges. Bake in a preheated 325 degree oven for 40-45 minutes, until only center of cheesecake jiggles. Turn off oven and leave cheesecake in oven with door to oven cracked for 1 hour. After 1 hour, remove cheesecake to rack to cool completely before refrigerating. Let cheesecake chill for 1 hour before adding decorative ganache. To make ganache, place chocolate chips and cream in a microwave safe bowl. Heat on high for 1 minute. Let chocolate rest for 5 minutes before stirring. Stir until completely smooth. Let cool. 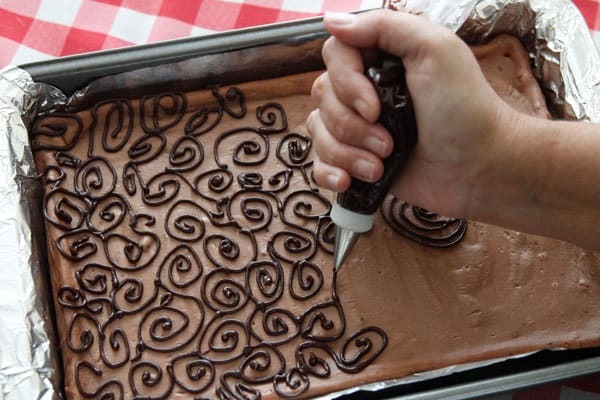 Spoon ganache into a pastry bag fitted with a #3 tip or you can use a plastic freezer bag with a small hole cut out of one corner. Drizzle chocolate ganache over cheesecake in any design. Refrigerate for at least 4 hours to completely chill before slicing. 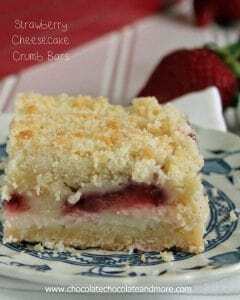 This recipe originally appeared at Melissa’s Southern Style Cooking as a Guest post. I’ve updated to add the recipe here for the convenience of my readers. Be sure to Be sure to check out Melissa’s Brown Sugar Walnut Fudge, Boston Cream Layer cake and her Italian Cream Cake while you’re there. I feel the very same about cheesecake. I could eat it ALL THE TIME! And it’s really not hard to make. These bars? YES! 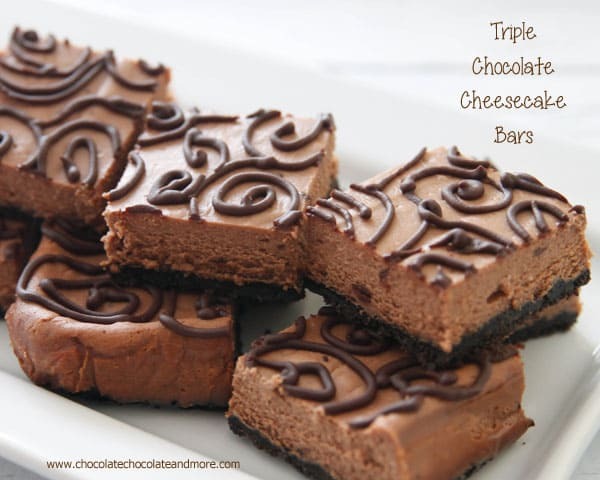 What is better than 1 chocolate…but 3!? Love the design too, it’s so cute – pinned! Such cute bars, Joan! And I love your fancy design on top! These sound delectable! Yes, use the creamy middle of the cookie too, it helps bind the crust. 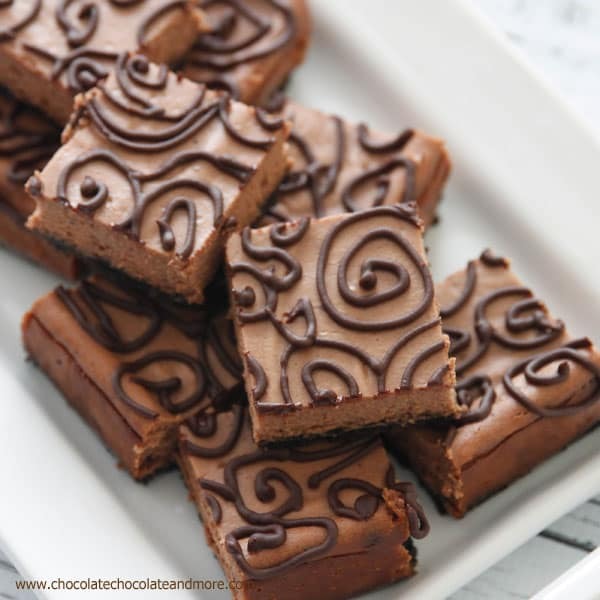 i love chocolate like crazy, this is such an yummy recipe! 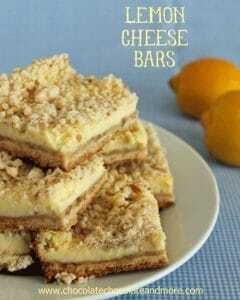 These look absolutely divine!!!! If I had to make these in a 9 inch pan would I have to halve the recipe? Yes, you would want to halve the recipe.